Abdul Majeed bin Abdul Aziz (Arabic: عبد المجيد بن عبد العزيز آل سعود, ʿAbd al-Majīd bin ʿAbd al-ʿAzīz ʾĀl Saʿūd) (1942 – 5 May 2007) was a prominent member of House of Saud. He was seen as a close ally of King Abdullah, but was also regarded as long-time ally of Sudairi Seven. Prince Abdul Majeed was born in Riyadh in 1942 as the 33rd son of King Abdulaziz. His mother was King Abdulaziz's tenth wife, Haya bint Sa'ad Al Sudairi who died on 18 April 2003 at age 90. She was a member of the powerful Sudairi family and the sister of Jawhara bint Saad who was another spouse of King Abdulaziz. Prince Abdul Majeed's full brothers are Prince Badr and Prince Abdul Ilah. Abdul Majeed bin Abdulaziz received his early education in Riyadh in traditional schools, including the Sheikh Abdullah Al Khayyat and the Al Anjal School. He joined in the Royal Saudi Navy in 1954 and then, studied in the United Kingdom. Abdul Majeed served as governor of three significant provinces in Saudi Arabia during his lifetime: Tabuk province, Medina Province and Makkah Province. After completing his education, he was firstly appointed governor of the northerly Tabuk province in 1980. Agriculture was developed in the province during his governorship, and the region became one of the kingdom's main producers of crops such as wheat and fruit. His tenure lasted for six years until 1986. After the death of his half-brother, Prince Abdul Muhsin, in 1986, Prince Abdul Majeed replaced him as governor of Medina Province. The Prophet's Mosque in Medina and surrounding areas were redeveloped during his 14-year term of office. He also established the Taiba Investment Corporation in Medina. His tenure lasted until 1999 when he was succeeded by Prince Muqrin in the post. In 2000, he was appointed governor of Makkah province and chairman of the Mecca development authority. He was also chief of the central hajj committee. In 2000, Mecca became the provincial capital of the region including Jeddah. An ambitious program of development was undertaken in Mecca under his stewardship at a cost of more than US$27 billion. The developments were centered on the Two Holy Mosques, the Masjid al-Haram in Mecca and the Masjid-e-Nabawi in Medina, the key destinations of the annual Hajj pilgrimage, attracting millions of visitors each year. Huge commercial developments sprouted in surrounding areas, such as the Jebel Omar scheme, including hotels, convention and conference centers, and prayer facilities. Architectural historians criticized the accompanying destruction of historic sites. On the other hand, communication links were improved, including port facilities in Jeddah, airports, and roads. In addition, Abdul Majeed initiated the restoration and development plans of old city of Jeddah. Abdul Majeed also called for greater participation of women in public life. "Prince Abdul Majeed has been a major supporter of Saudi businesswomen," said Hussa Al Aun, a member of the Jeddah Chamber of Commerce and Industry (JCCI). He called for women's participation in public life in Saudi Arabia. The Khadeeja bint Khuwailed Centre for Businesswomen was established in Jeddah in 2003 by the Jeddah Chamber of Commerce and Industry, under his patronage. He also supported the launch of an antiterror initiative in the province’s schools in December 2006. He also served on many public and charitable committees. He pushed for the creation of a motor racing track in Jeddah, the first in the Kingdom. He was also an early supporter of blood testing before marriage so as to avoid blood diseases. The procedure has since become obligatory. Prince Abdul Majeed was considered to be one of the potential candidates for the throne at the beginning of the 2000s. He was also considered as eligible contender following the death of King Fahd in August 2005. Prince Abdul Majeed was married to Sara bint Abdul Mohsen Al Angari, and had one son, Faisal bin Abdul Majeed. His son, Faisal, is a businessman and a member of the board of trustees of the Arab Thought Foundation. His wife, Sara bint Abdul Mohsen, donated 1 million riyals to a psychiatric hospital in Makkah during his governorship of Makkah Province. During the same period, Sara bint Abdul Mohsen paid the hospital expenses of a woman who experienced serious domestic violence by her husband in 2001. Prince Abdul Majeed bin Abdul Aziz Domestic Airport in Madinah was named after Prince Abdul Majeed. ↑ Taheri, Amir (2012). "Saudi Arabia: Change Begins within the Family". The Journal of the National Committee on American Foreign Policy. 34 (3): 138–143. doi:10.1080/10803920.2012.686725. ↑ "Prince Abdul Majid bin Abdulaziz". Toledo Blade. AP. 7 May 2007. Retrieved 4 August 2012. ↑ "Prince Abdul Majid, Governor of Mecca, Dies at 65". The New York Times. 7 May 2007. Retrieved 27 May 2012. ↑ "Saudi princess dies at age 90". Beaver County Times. 4 May 2003. Retrieved 4 August 2012. ↑ "Princess Haya Bint Saad Al Sudairi, 90, Wife of Modern Saudi Arabia Founder". Sun Sentinel. 7 May 2003. Retrieved 2 April 2013. ↑ Kechichian, Joseph A. (2001). 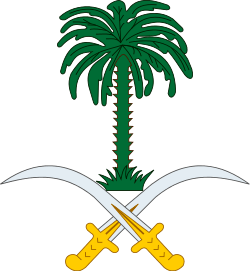 Succession in Saudi Arabia. New York: Palgrave. ↑ "Princess Haya, 90; Wife of a Founder of Modern Saudi Arabia". Los Angeles Times. 5 May 2003. Retrieved 4 May 2012. ↑ "One of the wives of King Abdul Aziz dies". Albawaba. 3 May 2003. Retrieved 22 January 2013. 1 2 3 4 Prince Abdul Majeed Passes Away, Arab News, 6 May 2007. ↑ "The list of all governors of Tabuk Province". Ministry of Interior. Retrieved 8 May 2012. ↑ Alhomayed, Tariq (6 May 2007). "Prince Abdul Majeed bin Abdulaziz". Asharq Alawsat. Retrieved 2 April 2013. ↑ "Profile: Prince Muqrin bin Abdulaziz". Asharq Alawsat. Riyadh. 2 February 2013. Retrieved 2 April 2013. ↑ "Abdulmajeed announces success of pilgrim's movement". Bahrain News Agency. 31 January 2004. Retrieved 4 August 2012. ↑ Faleh Al Dhuyabi; Majed Al Mufadhali (11 March 2010). "SCTA takes over Al-Saqqaf Palace". Saudi Gazette. Jeddah/Mecca. Retrieved 22 July 2013. ↑ Raid Qusti; Ali Al-Zahrani (13 January 2007). "Warm Welcome for Prince Abdul Majeed". Arab News. Retrieved 13 April 2012. ↑ Boucek, Christopher (September 2008). "Saudi Arabia's "Soft" Counterterrorism Strategy" (PDF). Carnegie Paper (97). Retrieved 17 July 2013. ↑ Taheri, Amir (2004). "Saudi Arabia: Between Terror and Reform" (PDF). American Foreign Policy Interests. 26: 457–465. doi:10.1080/10803920490905523. Retrieved 1 June 2012. 1 2 "Abdul Majid bin Abdulaziz, 65; was governor of Mecca". Boston. AP. 6 May 2007. Retrieved 2 April 2013. ↑ "Faisal bin Abdul Majid bin Abdul Aziz". Arab Thought Foundation. Retrieved 3 May 2012. ↑ Raphaeli, Nimrod (2003). "Saudi Arabia: A brief guide to its politics and problems" (PDF). MERIA. 7 (3): 20–33. Retrieved 3 May 2012. ↑ Soubra Barrage, Rada (2007). "The domestic challenges facing Saudi Arabia" (PDF). ecommons. Retrieved 8 May 2012. ↑ "Abdul Majid bin Abdulaziz, 65; was governor of Mecca". Associated Press. 6 May 2007. Retrieved 7 May 2012. ↑ "Saudi prince in charge of Mecca region dies at 65". BD News 24. Riyadh. Reuters. 5 May 2007. Retrieved 16 August 2012. 1 2 Abdul Ghafour, P. K. (7 May 2007). "Abdul Majeed's Funeral Today". Arab News. Jeddah. Retrieved 16 August 2012. 1 2 "Funeral prayers peformed for Makkah Governor Prince Abdulmajeed". Saudi Press Agency. 7 May 2007. Retrieved 2 April 2013. ↑ Abdul Ghafour, P. K. (16 October 2008). "Abdullah inspects plan for expansion of Madinah airport". Arab News. Retrieved 16 August 2012.